The Angora rabbit has quickly become the favorite pet of many animal lovers, due to its “fluffy” appearance. It has also caught the eye of dedicated rabbit breeders, who readily started crossbreeding and developing new varieties. Thus, from the original species imported from Turkey, today we have a multitude of varieties. This was another filed for the French and the English to compete in, each wishing to develop their own Angora rabbit breed. And they succeeded! The French and the English Angora were the first new breeds that appeared around the 1930s. Later on, other varieties were developed, especially out of the desire to develop a national Angora breed (e.g. the German Angora). However, these varieties appeared much later, in the 80s. The American Angora Breeders Association acknowledges only four breeds of Angora rabbits; these breeds are regarded as the most important ones by other similar organizations. The four breeds are: the English Angora, the French Angora, the Giant Angora and the Sation Angora. Because the German Angora is highly appreciated in the field and it’s becoming increasingly popular, we shall describe it as well in this article. It is the smallest of all varieties, weighing between 2 and 3.5 kg. Its entire body, including its face and eye, but excluding the nose and mouth area, is covered by a long, silky coat. It looks like a fluffy ball of fur and it is often mistaken for a dog (an Imperial Pekinese). It’s the only variety that has its eyes covered with fur. The coat is very thick and it gets easily tangled, if it isn’t combed at least twice a week. This breed is not suited for those who do not have the time or do not like to comb their pets. However, it is an ideal, highly appreciated pet, due to its fluffy appearance, as well as its docile personality. It is a very affectionate rabbit. In terms of color, this breed is varied; however, not all coat colors are accepted by specialized associations. The most common variety is the white one with red eyes, but the black, the blue, the chocolate brown, the purple and the stripped ones are equally appreciated. It is slightly larger than its English cousin, weighing between 3.5 to 4.5 kg. It is bred both for its coat, and for commercial purposes. 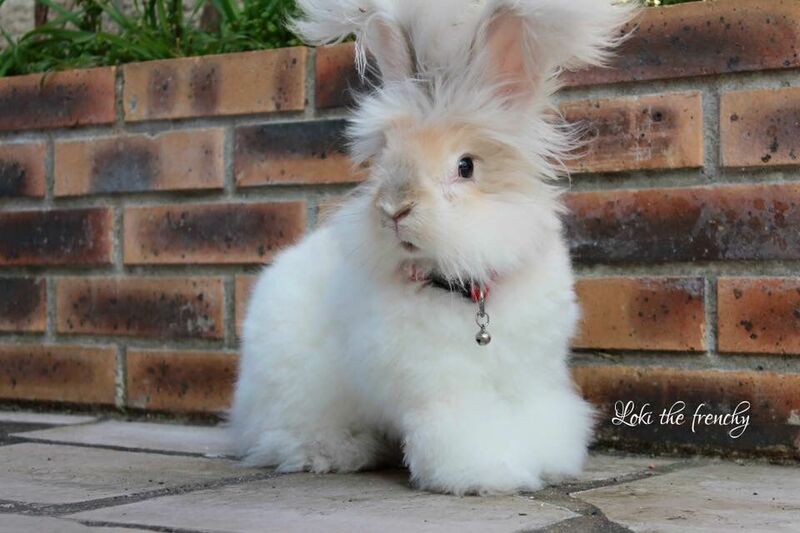 They make excellent pets and they are the most widespread Angora variety in our petshops. Its body is covered with shorter, thicker guard hair than the English variety. The undercoat is a silky, smooth fur, but it is covered by this coarser hair, which makes caring for it much easier. The French does not require combing as often as the English. Its face, its ears and its front legs are covered with short hair only. The French Angora may have fluffy tufts on the tip of its ears. Coat colors are as varied as those of the English Angora; the specimens with the front paws, the head and the tail of a darker color and the rest of the body white or of a lighter color are highly appreciated. 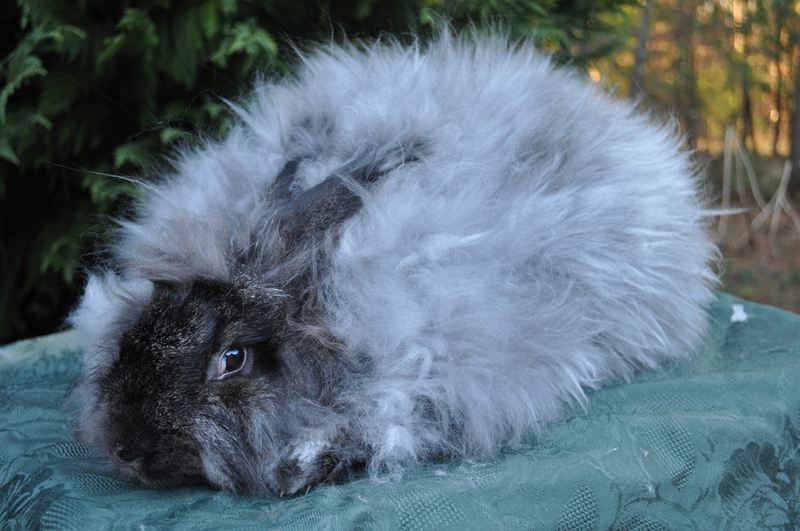 This variety weighs over 4.5 kg, being the largest of all Angora breeds. Its body is not as long, it is rather round, compact and vigorous. Its entire body, its ears, its front legs are covered by a silky, slightly curly coat, unique to the Giant and German Angora varieties; only the rabbit’s face remains visible. The only accepted variety is the white one with red eyes. It is bred for commercial purposes and especially for its wool; this breed produces more wool than all other Angoras together. Even though its shedding is not apparent, a certain cuantity of wool can be collected by hand. Generally, these rabbits must be shorn every three months, because they are prone to hair balls, but also in order to collect the entire quantity of wool produced by a specimen. It has to be brushed daily. Being large-sized rabbits, their growth is slower the male reaches maturity only around the age of 1.5. 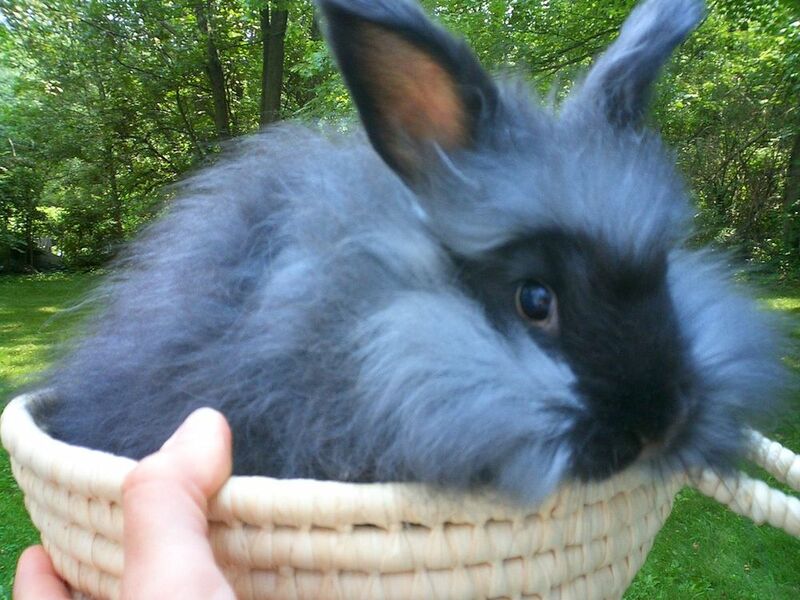 This variety was developed by crossbreeding a French Angora with a Satin rabbit. The result was an Angora rabbit similar to the French one, but smaller, weighing between 3 and 4.5 kg. The difference is the Giant Angora’s shinny, silkier coat. This breed is not very popular yet, even though the wool it produces is better for spinning and much softer than that of any other Angora. Unfotunately, its wool production is the lowest of all. Like the French, the Giant Agora is covered by a coarse guard hair, which makes it much easier to care for than the English. The accepted coat colors are the same as those of the French Agora. It weighs between 2 and 5.5 kg and it is similar to the Giant Angora, having the same long, curly coat on its entire body, except the head and the ears. Even though many specialized associations do not accept it yet, the German Angora is expanding. The breeders crossbreed it with different varieties, in order to obtain special nuances and wool textures. Those who spin wool manually are very fond of the German Angora’s wool. A specific accepted standard has not been defined yet, as constant crossbreeding does not allow for the development of one, homogeneous type.